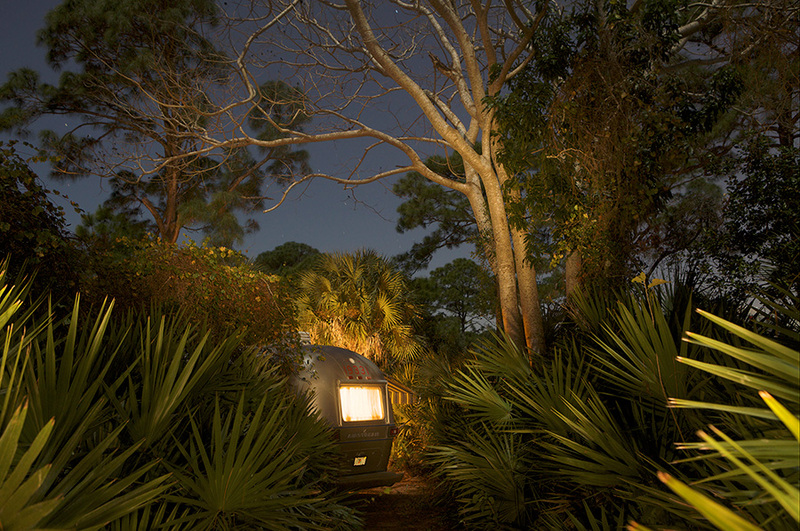 These images of recreational vehicles and campers—glowing life support pods—lodged in dense night jungles suggest a humanity isolated from a dark and ominous nature. The sense of displacement and alienation from the natural world conveys a relationship with nature in which something has gone very wrong. The occupants of these pods are sealed off from the natural world looming darkly just beyond. Or a social order in which something has gone very wrong. The creepiness of these pictures brings other topics into play: the retreat from public space and engagement in American life, and the interest in survivalism and individualism. These RV’s are the night song of a dark American dream, lovely and glowing, yet somehow toxic and chilling. I use artificial lighting and time exposures to make the image. The occupants never know I’m there; their blinds are drawn and their TV’s are on.